Our Spring 2019 Yoga Retreat is officially open for reservation! For more info, click here! Rolling Brook Yoga offers a full spectrum of classes for all levels. We focus on tradition, not trends. Our students receive step-by-step instruction, guided practice, and personal attention from experienced, certified teachers in a small class setting. At Rolling Brook Yoga, you can progress at your own pace. Enroll in a weekly class, purchase a class pack, or come to as many different classes as you like with our Monthly Memberships. Rolling Brook Yoga is located in Catonsville, MD, and is minutes from Ellicott City, Arbutus, Linthicum, and Elkridge. View our our schedule and our tranquil studio to see all the we have to offer. If you’ve never done yoga, our Yoga Basics class is the place to start. We have several Yoga Basics classes throughout the week to fit your busy schedule. 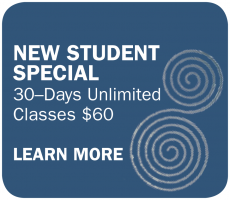 New students are eligible for our New Student Special. This allows you to attend as many classes as you’d like for 30 days. Please note that you do not need to register for a specific class to take advantage of this offer. Simply arrive a few minutes before the class you’d like to attend and we’ll take care of the rest! If you have a limited schedule, a second option is to enroll in a specific class. This is appropriate for students who know that they can only attend at a specific time each week. If you have any questions, please give us a call at 410-744-0946. Learn more about Yoga and how to prepare for your first class on our FAQ’s page.